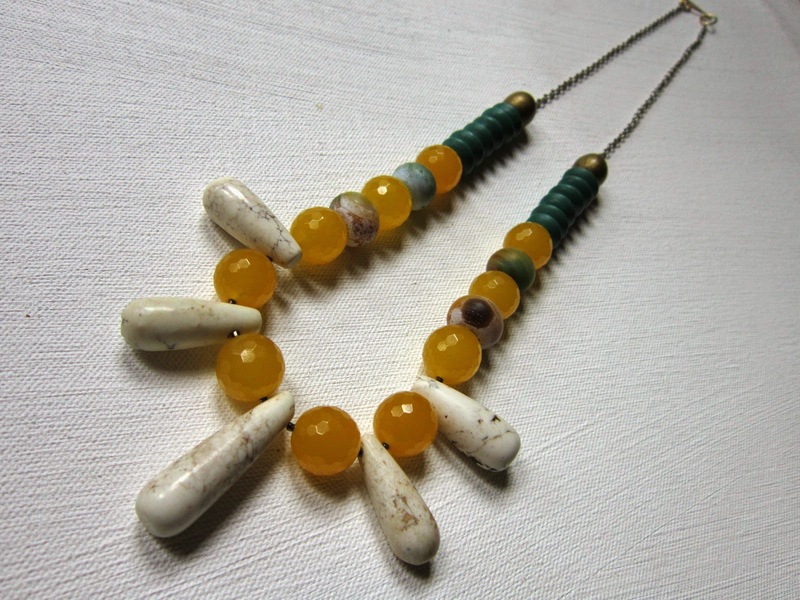 Bohemian Earth: Handcrafted Jewelry: News and New for Summer 2014! News and New for Summer 2014! It's been a while since I've posted, but I've had a creative couple of weeks (in the midst of teaching a summer composition class five days a week!). This spurt of creativity has been brewing for a while. Even though I haven't been actively creating and listing items in my Etsy shop, I'm always picking up materials and making notes for designs. The key is finding the time, and because I wear many hats, I have to make time. And I'm learning that making time for what I love (feeding my creative heart) is very important. Okay, back to the story. This spurt of creativity has been brewing and exploded into four new pieces (and one is nearly complete) due to a customer query. A customer from Spain messaged me about a few of my pieces (Intention I, O'Keeffe I, and Desert Fire) and wanted to know about shipping terms and my general suggestions about what would suit her best based on her preferences and coloration. Well, we messaged back and forth for days. The time change and my daily teaching schedule (coupled with her own busy schedule) made the process take longer than average. Yet, I wanted to make her happy. I wanted her to have the perfect piece. So, last Friday, I'd been thinking about her favorite colors, her preferred length, and what she'd told me about her complexion and coloring. Then, I got to work and Florencia en Verano (named for my lovely customer) was born. These colors are so lovely! The next morning, she sent me pictures of herself and told me she'd settled on Intention I if I could change of clasp color to silver. 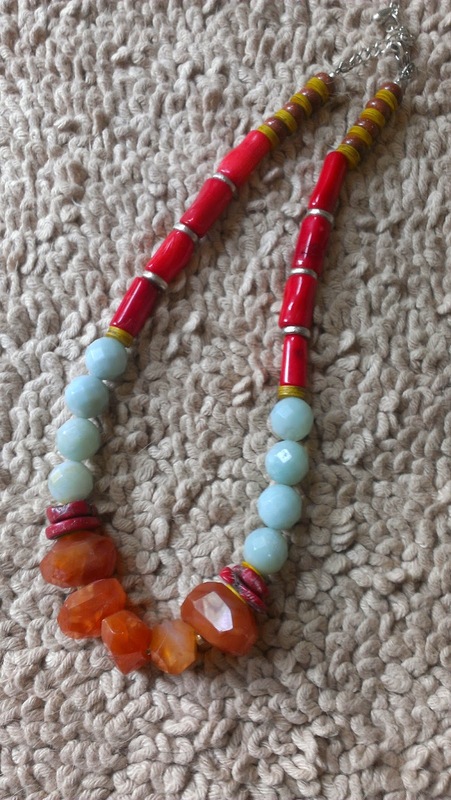 Of course I would, I answered, but then I told her about my mad night-into-morning of design and creation, sent her pictures of the necklace I'd just completed with her in mind, and hoped that she would love it. 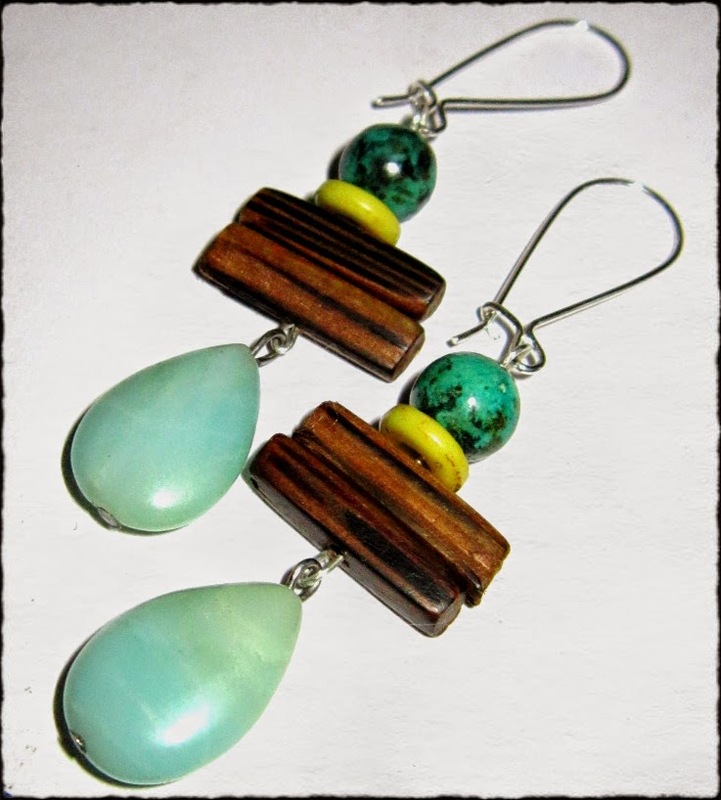 And then she asked me to make a pair of earrings to compliment her overall style. So, I promised to make her two pairs and let her decide to take one or both. Thus, the Cherimoya and Watermelon earrings entered the world. She chose the Cherimoya pair, as I had a feeling she would, and now I'm waiting to hear of the necklace and earrings' arrival in Spain. I hope she loves it all even more in person. 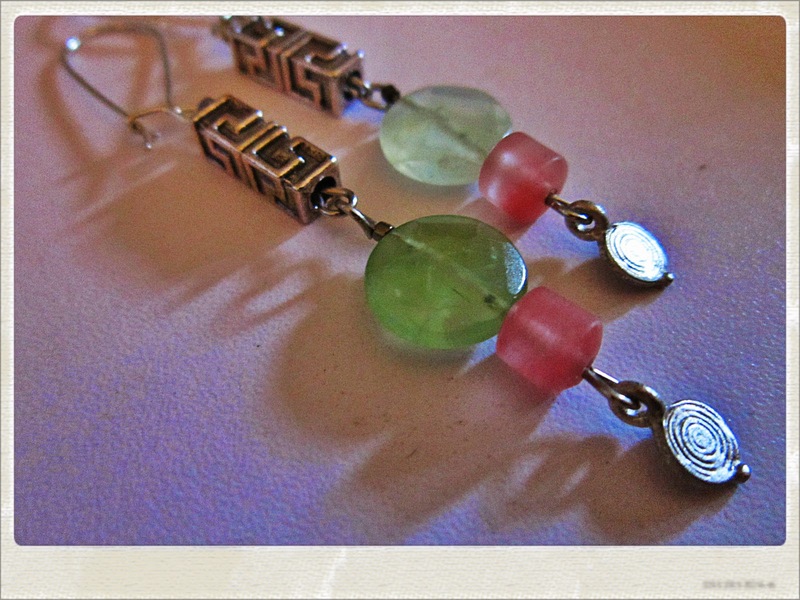 So, both the Cherimoya and Watermelon earrings are limited edition and are available. 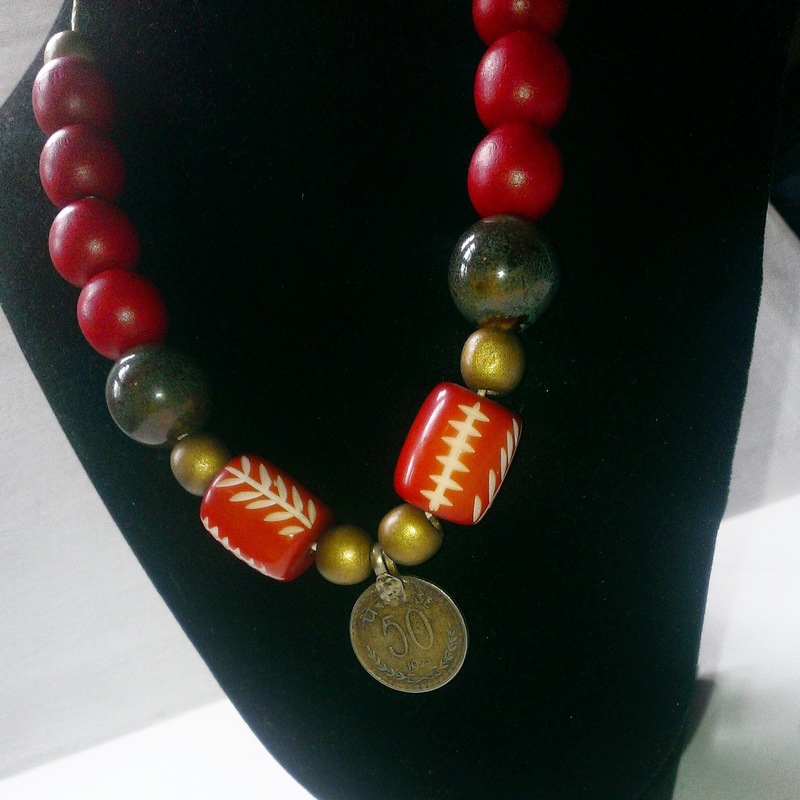 Florencia en Verano is one-of-a-kind, but I can always make similar pieces based on my available materials. I'm also open to creating commissioned pieces with materials of your choice (just tell me what you'd like, and if I don't have it, I'll buy it and we can negotiate a budget). And, here's a custom piece I made for a customer last April featuring pink and green agate and jade and radraksha seeds. Featuring some of my favorite faceted pink agate. 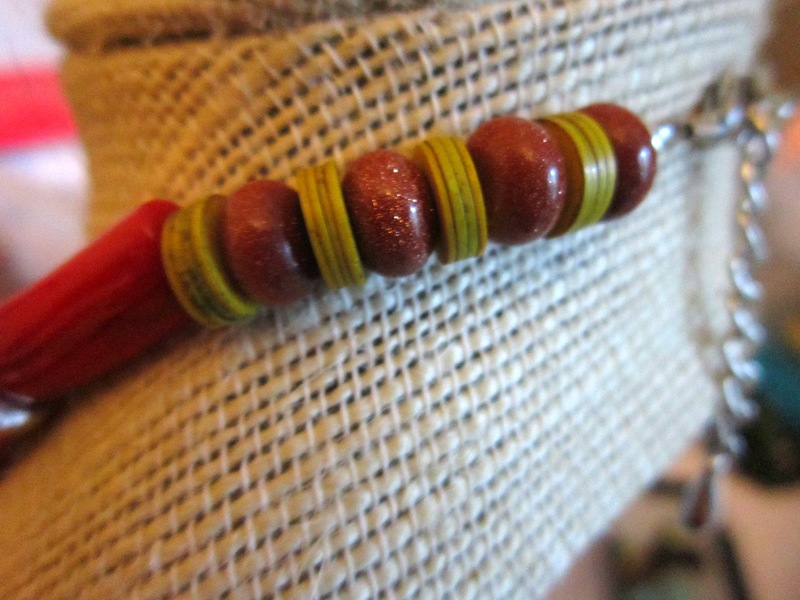 The radraksha seeds are often used in Buddhist prayer beads. 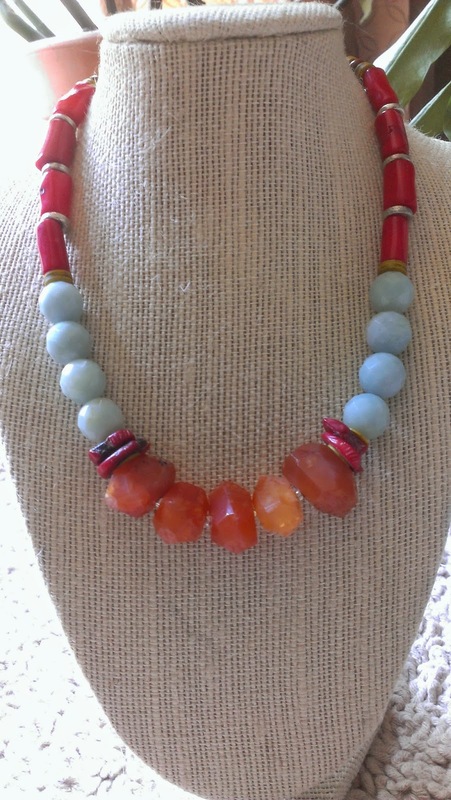 Thank you all for reading and following my journey in jewelry making!